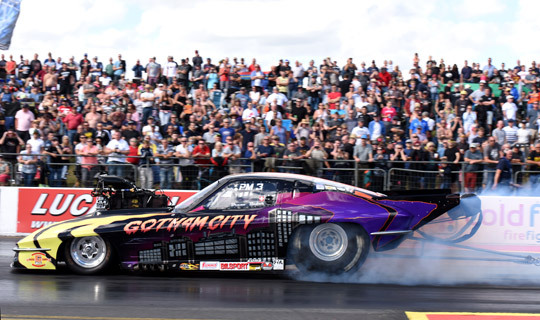 The FIA European Pro Modified championship was decided in the best possible way, in a direct confrontation between the two remaining championship contenders, Michael Gullqvist and Bruno Bader. In the semi-final the Swedish champion leader defeated the Swiss number two, to claim his second consecutive title. As Gullqvist was the only driver to break the 6-second barrier, was by far the quickest driver of the event with 5.88 seconds, and defeated Mats Eriksson in the final, the Swede deserved to win the title. After his early exit at the Scandinavian Internationals, championship leader Michael Gullqvist entered the European Finals with an eight point lead over Bruno Bader. But the Swedish and Swiss drivers were not the only title candidates, as last year’s runner-up, Mats Eriksson, was only 26 points behind. Johan Lindberg was the number four in the championship, but was 64 points behind Gullqvist. With the forecast of a rain out on Saturday, the teams knew they had to set their time on Friday. 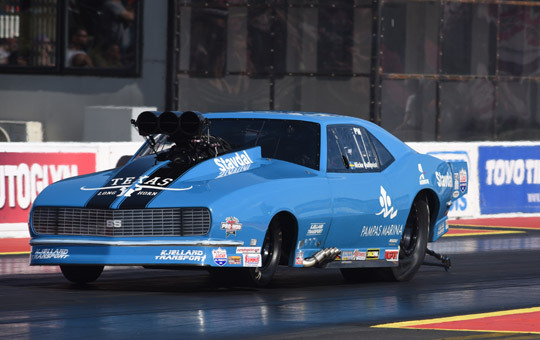 Gullqvist immediately made loud and clear what his intention was for this weekend, and after 6.02 seconds in the first qualifying, the Swede stormed to a stunning 5.91 seconds on his second run. None of the other drivers could break into the 5-second zone, although Johan Lindberg came close on his second run with 6.004 seconds. 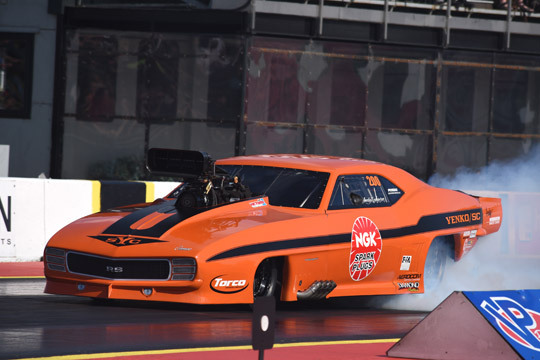 Eriksson and Bader ended qualifying in third and fourth position, and were not too far behind with 6.05 and 6.06 seconds elapsed times respectively. 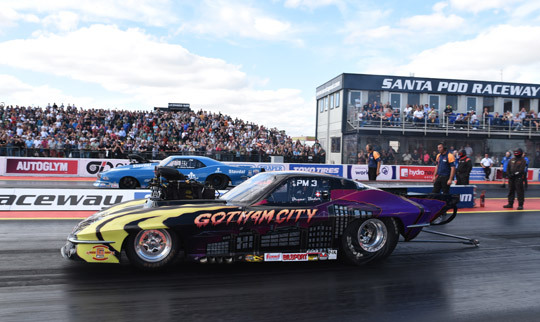 Andy Robinson gave the home crowd something to cheer about with the number five qualifying position, while NitrOlympX runner-up Marck Harteveld once again impressed with 6.18 seconds and the number six qualifying position. Regular FIA European Championship contender Thomas Stiefel was seventh, while rookie Michel Tooren proved to be a real threat by claiming the eighth position. David Vegter, the number five in the FIA European Championship, had to rebuild his spare motor after the severe engine damage he suffered at Tierp. 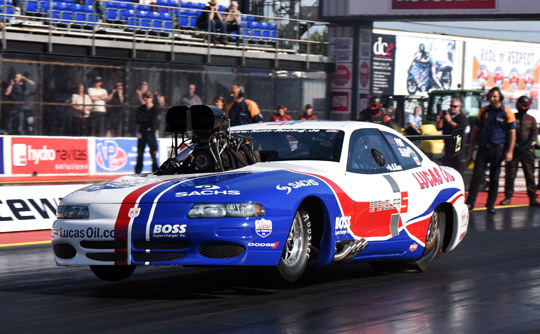 Vegter had some problems to find the right set-up and the Dutch racer was 13th with 6.32 seconds. 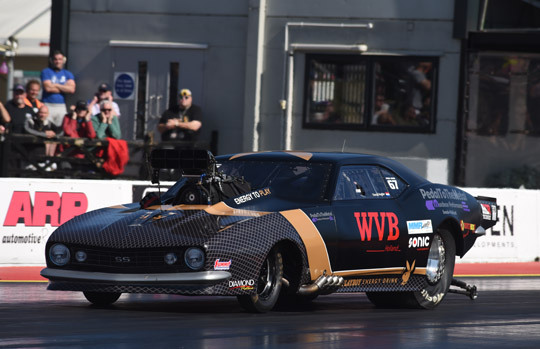 As the number thirteen qualifier has to face the number four in eliminations, for the third race in a row Vegter had to race Bader on Sunday. 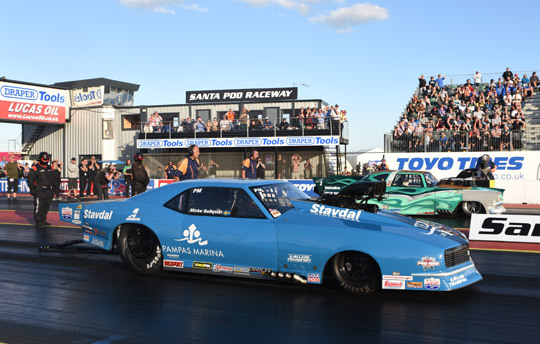 The Pro Modified field at Santa Pod was extremely competitive. Although the teams only had two runs, the bump sport was 6.77 seconds and (apart from Gullqvist) all other fifteen drivers were within 0.77 seconds of each other. With 6.82 seconds first alternate Wayne Nicholson was also in the six seconds! Number one championship contender Gullqvist had no problems with Marcus Hilt, as the Swiss driver pulled a red light and the number one qualifier proved to be both quick and consistent with 6.05 seconds at 242 mph. Eriksson recorded 6.03 seconds, was way too quick for Jean Dulamon, and also advanced to the next round. 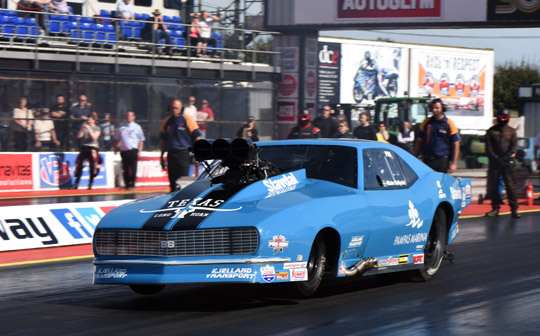 Bader had some more problems with Vegter, as the Dutchman improved to 6.09 seconds. But Bader’s elapsed time was 6.02 seconds, and for the third consecutive race the Swiss driver defeated Vegter. Lindberg proved his good form with 6.01 seconds to defeat Roger Moore. But none of the Swedes was the quickest driver in the first round! That honour went to Tooren, who defeated Bert Englefield! The Dutch rookie stormed to a new personal best of 6.005 seconds, almost his first ever ‘five’ in his first year of racing! 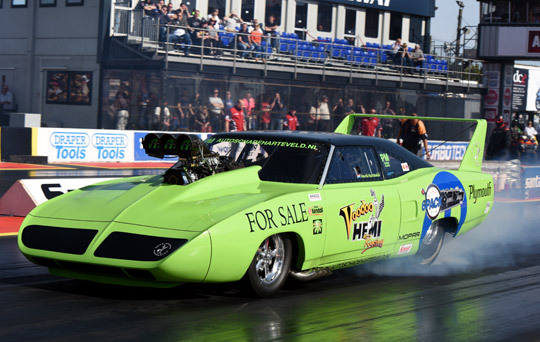 The Pro Dutch Racing team will be a force to be reckoned with when they do the full FIA tour next year. Stiefel had to abort his run when the Swiss number six in the championship ran into problems and saw Norbert Kuno take the win. 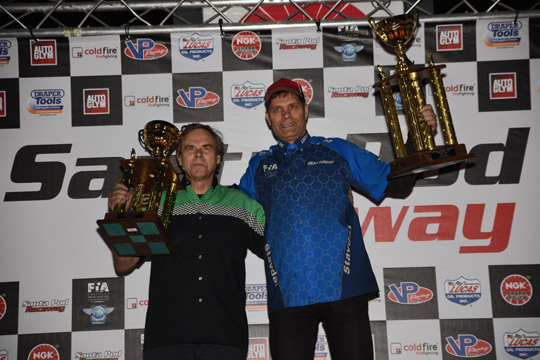 Harteveld couldn’t surprise again as the Voodoo Hemi Roadrunner was hit by severe tyre shake and was beaten by British champion Kev Slyfield. Would it be possible for Tooren to spoil Gullqvist’s championship dream, that was the big question in the quarter finals. 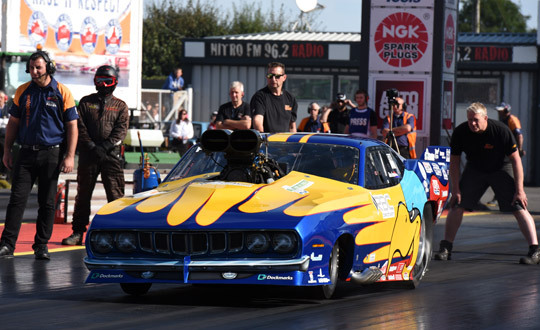 The answer was no, as the Pro Dutch Racing Cuda suffered severe tyre shake at the start line, while Gullqvist stepped up to a stunning 5.899 seconds. 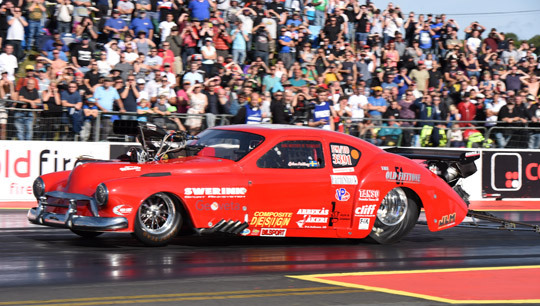 Bader had a bye run, as Robinson had to withdraw after suffering engine damage in his first round win over Marco Maurischat. 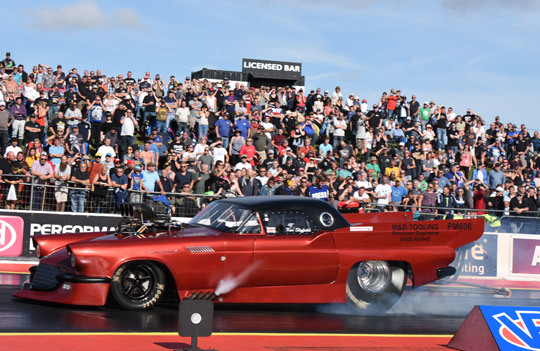 In the other quarter finals Lindberg (6.08 seconds) defeated Kuno, while Eriksson once again recorded 6.0 seconds to beat Slyfield. Thus the top four drivers in the championship were all in the semi-finals. 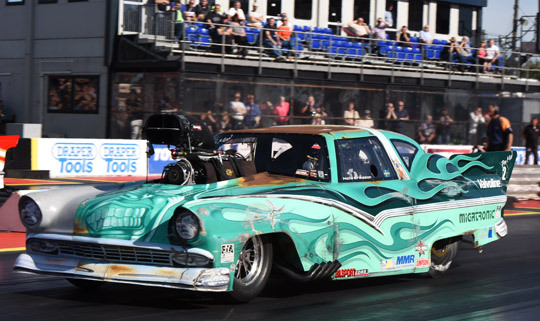 The 2016 FIA European Pro Modified Championship reached its climax in the semi-finals. Gullqvist had to face Bader, and as one of these two would advance to the final, even a win in the final wouldn’t be enough for Eriksson to claim the title. That Eriksson would be in the final, was no question, as Lindberg suffered engine damage in the quarter final and couldn’t come back for the semi-final. 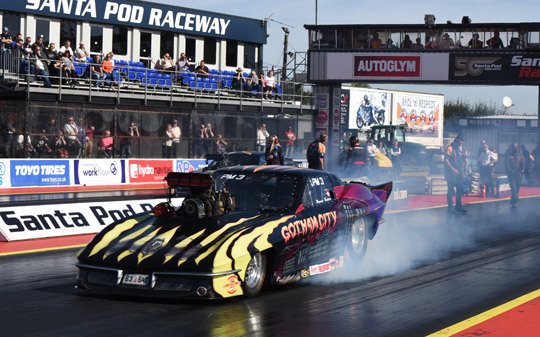 In the most important run of the season, Gullqvist once again proved his great Santa Pod form. 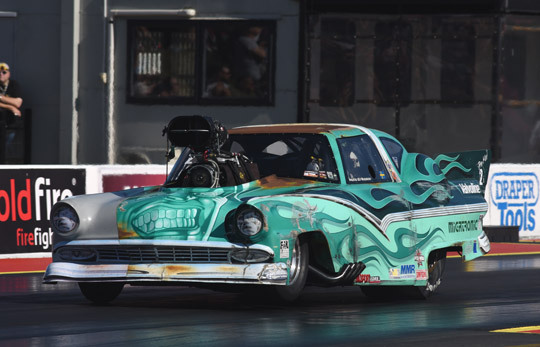 The reigning champion stormed to 5.90 seconds (Bader 6.16 seconds), to take the win and the 2016 title. In the final, Gullqvist had to face Eriksson. The just crowned champion took it all, stormed to a winning 5.889 seconds at 243.83 mph, setting low ET and top speed of the race, and defeated Eriksson. The runner-up had a slightly better reaction time, but slowed down to 6.11 seconds. 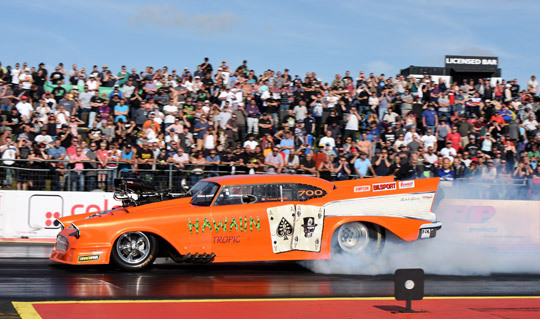 With his ETs, speed and consistency, Gullqvist was in a class of his own at Santa Pod and proved to be the real 2016 champion. Eriksson’s Euro Finals runner-up position was enough to jump over Bader and claim the second position in the championship. With Bader in third, the top three in the championship were exactly the same as they were in 2015. Behind Bader, Lindberg ended in fourth position, with Vegter being fifth and Stiefel sixth. Åke Persson and Marck Harteveld were seventh and the best of the drivers who did a limited FIA schedule this season. The top ten was completed by Kuno and rookie Tooren.